For you who like to watch. did you ever hear or watch a movie called Shaolin Temple ?..... Of course most of you have never heard it know watch it. Therefore make sure you watch the movie shaolin tample this new, of course, with effects that are far more interesting. In 1982, a Hong Kong film director Chang Hsin-yen, the release of Shaolin Temple movie which tells about the events of the invasion, assault and burning of a Shaolin temple by thousands of troops of the Qing Dynasty. Shaolin Temple, which form the first Hong Kong film production are allowed to take pictures in the China mainland, quickly achieved great success at the time of its release, help the resurgent popularity of the martial arts kung fu at once lifted the name of a new star, Jet Li, to the row actor board over the country. 29 years later, director Benny Chan (City Under Siege, 2010) tried to retell the story of the Shaolin Temple to a new generation of film audiences through the film's remake, titled Shaolin. Although a remake, with the help of playwright, Alan Yuen, Chan made some changes to the movie plot seems mostly intended to increase the dramatization of the various scenes in the film. By bringing big names like Andy Lau, Jackie Chan and Nicholas Tse to fill in the acting department as well as choreographer, Corey Yuen - who has experienced decades of dealing with hundreds of Asian and Hollywood action movie, Chan seems indeed intend to make the Shaolin as a blockbuster first film in Hong Kong for this year. The story itself motivated some time after the fall of the Qing Dynasty, when many parties fighting to seize each other's territory without regard to its effect on residents in the area who often become victims of many wars. Here, the audience then introduced in Hou Jie (Lau), a warlord who was fearless and had just won the city of Dengfeng with his right hand, Cao Man (Tse). His success makes Hou Jie became the proud man and never care about anything else other than self-interest. Hou Jie later life totally turned around when Cao Man betrayed himself by the seat of power grab. Betrayal - which claimed the daughter of Hou Jie sole and makes his wife, Yan Xi (Fan Bingbing), decided to leave him for good - make Hou Jie aware about what the treatment for this. Through the help of a cook (Chan) in a Shaolin temple, Hou Jie then intend to edit and delete all the bad nature and start a new life as a student at the temple. However, carp and certainly can not just disappeared. Cao Man who knew that Hou Jie is still alive, then offered a reward to anyone who can catch Hou Jie. Apart from the title that might make some people think that this film will present a row of action scenes that use martial arts Kung Fu, Shaolin is by no means a proper movie to be categorized as an action film. Of course, Benny Chan still include a number of scenes involving the use of Kung Fu and capable of properly directed by the choreographer Corey Yuen, but overall, Shaolin is a Chinese tale land melodrama which tells of the struggle to atone for an error which inserted the principles of Buddhist wisdom. Although it sometimes sounds too patronizing, but Benny Chan's decision to incorporate these values seem very relevant indeed to reflect what is happening in the social life of the world today. Even so, it must be admitted cinematographer Shaolin Chan capable of assembling into a movie with the emotional fabric of a fairly well preserved. The best moments of this film at the beginning of the film, when Chan managed to provide enough intensity in scenes when presenting a row of war at the same time very touching dramatization when presenting the tragedy that befell the family Hou Jie. Unfortunately, the slow rhythm of Shaolin Chan began slowing in a way to bring out the life story of Hou Jie character. This section, which is filled with the life of the disciples of Shaolin as well as on the lives of communities living around the temple, felt only as a patch before Chan's story focuses on the story back story that carried troops attack Cao Man of the Shaolin temple. 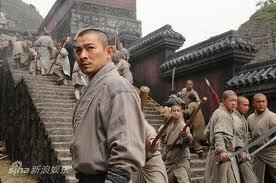 In his role, Andy Lau is still able to properly demonstrate its capacity as a great actor. The change reflected well the nature of his character through his acting is natural since the beginning until the movie ends. While serving his acting a bit, Jackie Chan also managed to steal the show with the ability of comedy and martial arts which he displayed. Unfortunately, the same does not apply to Nicholas Tse, who is able to bring an antagonistic and mysterious character well but did not get digging deeper character that makes his character too monotonous. In addition to these three actors, nearly all ranks of the department's acting filler is able to show his best game, especially the supporting characters are displayed by the actor Wu Jing and actress Fan Bingbing. Although both are fairly minor role, but each of its presence could provide additional energy at the way the story presented. Succeeded in presenting pictures that are very beautiful, well-maintained technical procedure and greatly facilitated by a chic from the ranks of actors of this movie, Shaolin is a film that is able to present a story filled with many spiritual messages but still capable of entertaining the audience. Indeed, the way the story written by Alan Yuen was so familiar with a couple of times had seemed saturated, especially with some additional plots that are not so important for the present. But beyond these points of weakness, Benny Chan managed to become a Shaolin working with a very impressive package and quality that does not disappoint.